Extended from Wallington to Crystal Palace as part of Trolleybus replacement route 654. (CN ) garage closed. New Saturday (ED) introduced. New Sunday (A) allocation introduced. ED withdrawn - Sunday TH introduced. 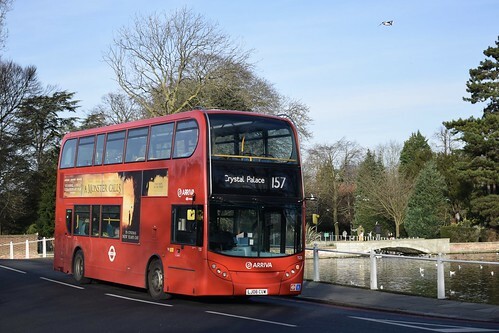 Service enhanced with the withdrawal of service 154 between West Croydon and Crystal Palace. Northbound journeys diverted via Wallington Station forecourt. (A) allocation withdrawn. Monday-Saturday (TH) transferred to (TC). Sunday (AL) introduced. Sunday (AL) withdrawn. Sunday (TC) introduced. (TH) withdrawn. Daily (TH) re-introduced. Sunday (TC) withdrawn. D type buses replaced by M.
Changeover point Crystal Palace - crews using a ferry bus.